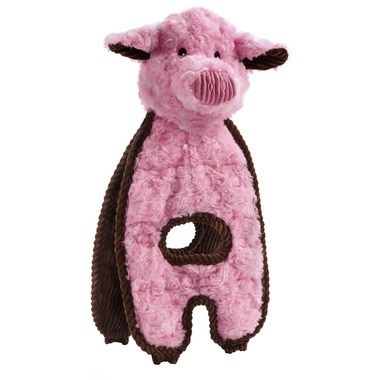 I have to add another review of this product... this toy has withstood almost constant play by my dog with no tears in sight yet, although a couple of the squeakers are now broken. He carries it everywhere (even tries to go outside with it on our walks! ), and cuddles it when he's in his bed. He loves the noises and how fun it is to shake it and hear the crinkling. If you've been hesitating to buy this toy without seeing it in person first, hesitate no more - the tug dog toys are well made and will be well enjoyed by your fur baby!! My dog LOVES this toy!! It's got three different squeakers and crinkly sounds - a very interactive experience!! Sturdy construction, and will likely last quite some time before he 'kabooms' it. Going to buy another one as a backup, as he really loves this one.